"Music reading made easy! With MIDI Pianist you reach your goal quickly and effortlessly - and it really makes fun!" MIDI Pianist - the Software to learn and practice music reading. MIDI Pianist assists you to learn and practice reading music notes in treble and bass clef. The software shows you random notes which you have to repeat as fast and correct as possible by using your MIDI keyboard or the integrated on-screen keyboard, which can be operated by mouse or touch screen. 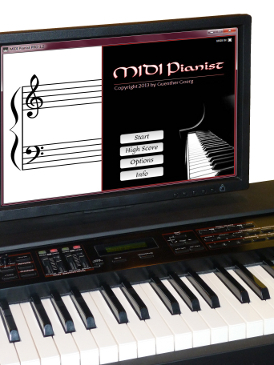 MIDI Pianist provides 30 different levels and is suitable for total beginners as well as experienced pianists. The higher the level, the bigger the range of notes. A challenging scoring system gives you instant feedback about your skills and monitors your progress over time. There are two versions of MIDI Pianist: The free LE version provides 12 levels without any further restrictions and offers an excellent introduction into the world of piano sheet music. The fair priced PRO version contains 30 levels and is rather suitable for more experienced players - and for anyone who wants to become one.